In January 1997, the Central Depository System (CDS) was successfully executed, which added prompt, efficient clearing and settlement of trades and simultaneously abbreviated a number of the inherent risks ... National Investment Trust Ltd.
from stock market development to economic growth and there is evidence of an indirect transmission ... Published by Canadian Center of Science and Education. Department of Banking and Finance, Nnamdi Azikiwe University, Awka ..... bodies in the Nigerian stock market are the Securities and Exchange Commission .... and corporate entities with some supplementary financial instruments that are. Does Stock Market Development Promote Economic Growth in Ghana? direct investment (FDIs) and stock market boom are the indicators of the changing ... Undoubtedly, stock markets are expected to increase economic growth by. Conversely, causality connection refused for the economies where the equity market is undersized and less liquid. Nowbutsing and Odit (2011) suggested the. Dec 1, 2001 - Economic growth in a developing economy hinges on an efficient ..... [Online] Available: http://www.douala-stock-exchange.com/motdir_us.php. pects of the Madrid, Barcelona, Valencia and Bilbao Stock Markets, the ..... bull phases is not correctly replicated by any DGP, although this can be due to. economic growth in three Latin American countries and four Southeast Asian countries for the period 1980-2009. The study uses a balanced panel regression. Email: [email protected] and ... Email: [email protected] ..... SBC is known as the parsimonious model: selecting the smallest possible lag length,. Abstract Finance-growth nexus is reinvestigated by time series econometric techniques (unit root test, co-integration, error correction mechanism and granger causality) over the period of 1980-2011 for Nigeria. Economic growth was proxy by Real Gross Domestic Product (RGDP) while stock market development measures considered include; Market Capitalization (MCAP), Turn Over Ratio (TR), Total Value of Share Traded (VLT), and All Share Index (ASI). The study reveals that turnover ratio (TR) positively and significantly influences economic growth both in the short-run and long-run while total value of share traded (VLT) and all share index (ASI) were significant in the short-run. Also, all share indexes was observed to have a negative slope coefficient while value of share traded has a positive slope coefficient. Market capitalization positively and significantly influences economic growth in the long-run. 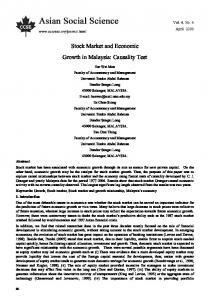 The Granger causality test showed that economic growth promotes stock market development, but there is evidence of causality running from stock market development to economic growth. This result is consistent with theoretical postulation which suggests that stock market development have a key role to play in the economic growth of developing countries. In light of these findings, the study recommends that the government should promote greater regulation, supervision, and security of stock market and also improve the existing infrastructure in order to increase the level of investment in the market. Section 2 provides a review of the literature. Section 3 deals with the data and methodological issue. Section 4 presents empirical findings, while, section 5 concludes the paper. Adamu and Sanni (2005) investigate the relationship between stock market and economic growth in Nigeria using Granger-causality test and regression analysis. The result reveals a one-way causality from GDP growth to market capitalization and a two-way causality between GDP growth and market turnover. They also found a positive and significant relationship between GDP growth and turnover ratio. Abu (2009) investigate the impact of stock market development on economic growth in Nigeria employing Error correction method. The researcher found that stock market development increases economic growth in Nigeria. Adenuga (2010) examined the relationship between stock market development indicators and economic growth in Nigeria using vector error correction model (VECM) technique, for the period 1990 to 2009. He employed three measures of stock market development [total value of shares traded ratio (vr), market capitalization ratio (mcr) and turnover ratio (tr)]. The result shows a positive relationship between the three indicators that represent stock market development and economic growth in Nigeria. 3.0 Methodology The paper examines the effect of stock market development on the economic growth of Nigeria. The study hypothesized that stock market development does not have a significant effect on Nigeria’s economic growth. To test the hypothesis, annual time-series data from 1980 to 2011 was obtained from the Central Bank of Nigeria Statistical bulletin. The model is built on the empirical work of previous researchers and estimated employing the econometric techniques of Augmented Dickey-Fuller (ADF) unit root test, Johansen co-integration test, and Error Correction Mechanism (ECM). Specification of Empirical Model The model is based on the modification of the empirical models of Abu (2009) and Adenuga (2010). Real Gross Domestic Product (GDP) measured economic growth which is the dependent variable as a function of Market Capitalization (MCAP), Turn over Ratio (TR), Total Value of Share Traded (VLT), and All Share Index (ASI).The functional relationship of the model becomes; RGDP= F (MCAP, TR, VLT, ASI)………………………………………………………. (1) Equation (1) can be express in its econometric form as follows: RGDP= a0 + a1MCAP + a2TR + a3VLT + a4ASI + Ut………………………………….. (2) Where: RGDP = Real Gross Domestic Product MCAP= Market Capitalization TR = Turn Over Ratio VLT = Total Value of Shares Traded ASI = All Share Index Ut= Error term A Priori Expectation a1, a2, a3, a4> 0. Source: Researcher’s Computation (2014) using E-views 7.0 Max-eigenvalue test indicates 3 cointegratingeqn(s) at the 0.05 level * denotes rejection of the hypothesis at the 0.05 level **MacKinnon-Haug-Michelis (1999) p-values An examination of the co-integration test results in table 2 reveals that both trace and maximum Eigen value statistics indicate 3 cointegrating equation (s)at 5% significance level. This is because both the trace statistic and maximum-Eigen value statistics are at this level greater than the 5% critical value respectively. Thus, the results indicate the existence of cointegration among the variables, and as such, a long run equilibrium relationship exists among them. Error Correction Model Analysis In order to ascertain the speed (rate) with which the real gross domestic product (RGDP) will adjust to changes in the explanatory variables, the error correction model was specified. The results obtained are presented below. Table 3: Error Correction Model (ECM) Result Dependent Variable: RGDP Variables C DVLT DTR DMCAP DASI ECM(-1) R-squared Adjusted R-squared F-statistic Durbin Watson stat. Source: Researcher’s Computation (2014) using E-views 7.0 An examination of the result in table 3 shows that the estimated error-correction has impressive goodness of fit. The R2value of 0.930632 and its adjusted counterpart of 0.916180, indicates that over 91% of the short run systematic variations in Real Gross Domestic Product (RGDP) is explained by the four explanatory variables during the period of study. The F-value of 64.39 is highly significant at the 1% level. Thus, the hypothesis of a significant linear relationship between the dependent variable is validated. In terms of the contribution of the individual explanatory variables, all the sign of their coefficient (except All Share Index) are correct. The f-value of market capitalization is not significant. This implies that market capitalization value do not influence economic growth in Nigeria in the short-run. The coefficient of value of share traded, turnover ratio and all share index are significant at 5%, 1% and 4%level respectively. Therefore, value of share traded turnover ratio and all share index influence economic growth in Nigeria. This is a clear indication that stock market development has a significant impact on economic growth in Nigeria. The Durbin Watson statistic of 2.086757 (which is approximately 2) shows that the estimated error-correction model is free from serial correlation. The ECM term in the result has the expected negative sign and is significant at two percent level. The error correction term capture the speed of adjustment from short run equilibrium. The coefficient indicates that the contemporaneous adjustment of economic growth is about 83 percent which is very high. 4.3. The Long-Run Analysis Having analysed the empirical result of the short-run dynamic model, we proceed to analysed the long-run model. The result of the estimated long run model is presented in table 2 below: Table 3: Regression Result Dependent Variable: RGDP Variables C ASI MCAP TR VLT R-squared Adjusted R-squared F-statistic Durbin Watson stat. 5. Conclusion and Recommendation In this study, the empirical relationship between stock market development and economic growth was exhaustively examined, specifically to determine the effect of stock market development on economic growth. For this purpose, a multivariate regression model was specified to depict the empirical relation of stock market development and economic growth in Nigeria. Four measures of stock market development; market capitalization, all share index, turnover ratio and total value of share traded were included in the empirical analysis. Using annual time series data covering the period 1980 – 2011, Cointegration test, Error correction model and Granger causality test were employed in estimating the specified model. The overall conclusion of the study is that stock market development has a strong effect on economic growth. Specifically, all the explanatory variables except All Share Index positively and significantly influence economic growth in the short run; All Share Index has a negative influence though significant. In the long run all the explanatory variables positively influence economic growth. However, market capitalization and turnover ratio are significant while All Share Index and total value of shares traded are not significant. The Granger causality test result indicates a unidirectional relationship running from RGDP to MCAP, TR , VLT and ASI. Therefore, economic growth granger cause stock market development, but there is evidence of causality from stock market development to economic growth when turnover ratio was used to measure stock market development. The following recommendations are made on the basis of the findings of this study:  The ongoing reforms in the Nigeria financial sector should be continued and pursued to the latter in the capital market. This is because it is apparent that the existence of a well-developed and efficient capital market will contribute to the objective of rapid and sustainable growth. The capital markets are to be restructured as efficient tools of domestic resource mobilization with policies and measures adopted to increase their depth and competitiveness. Other capital market reforms include; Reduction of the costs of intermediation and floating new issues; Adoption of measures and strategies to strengthen and enhance official supervision of trading in the securities market so as to make them attractive assets (Iyoha, 2004).  Improve financial infrastructure through the development of various financial products and services, which has been a major problem militating against the level of investment in developing country like Nigeria when compared to developed countries.  Trading systems of stock market should be improved – since this improves stock market operations, allowing stocks to trade more frequently and speeds up the purchase and sale process of stocks, in this way enhancing stock market liquidity and efficiency  Promote greater regulation, supervision, and security of stock market – since this is a major hindrance to investment activity in Nigeria, where there is low investor confidence in the stock market and its ability to safeguard investments, thus the improvement of security and regulation procedures will likely stimulate information disclosure and reduce misrepresentation and other financial crimes, leading to improved investor confidence. This will enhance market participation, investment and stimulate growth. Robinson, J. (1952). The generalization of the general theory. In: The Rate of Interest and Other Essays. London: MacMillan. Schumpeter, Joseph A. (1912).Theorie der Wirtshaftlichen Entwicklung (The Theory of Economic Development). Leipzig: Ducker and Humblot. Translated by Redvers Opie. Cambridge, MA: Harvard University Press. Shahbaz, M., Ahmed, N. & Ali, L. (2008). Stock market development and economic growth: ARDL Causality in Pakistan. International Research Journal of Finance and Economics, 14 (2), 182 – 195. Shaw, E.S. (1973). Financial deepening in Economic Development. New York: Oxford University Press. Tsuru, K., (2000). Finance and growth: Some theoretical considerations and a review of the empirical Literature, OECD Economics Department Working Papers, No: 228. Van Nieuwerburgh, S., Buelens, F. & Cuyvers, L. (2006).Stock market development and economic growth in Belgium. Explorations in Economic History, 43 (2), 13 – 38. 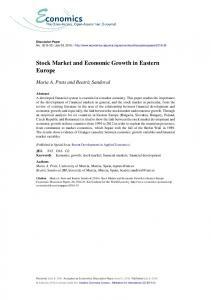 Report "Stock Market Development and Economic Growth in"